Since childhood reading has been a big part of my life. I try to read as often as I can, however sometimes life gets in the way and my guilty pleasure of a good book and a glass of wine has to be put on hold. I began reading Adria’s new novel on a flight home to Miami after visiting my sister in North Carolina. Her characters took a hold of me immediately and I was hooked. I read vigorously on my iPad through flight delays and connections until the battery went dead, I continued reading well into the wee hours of the night on my Kindle until that battery died as well. I was excited when I finally finished the last two chapters that morning. 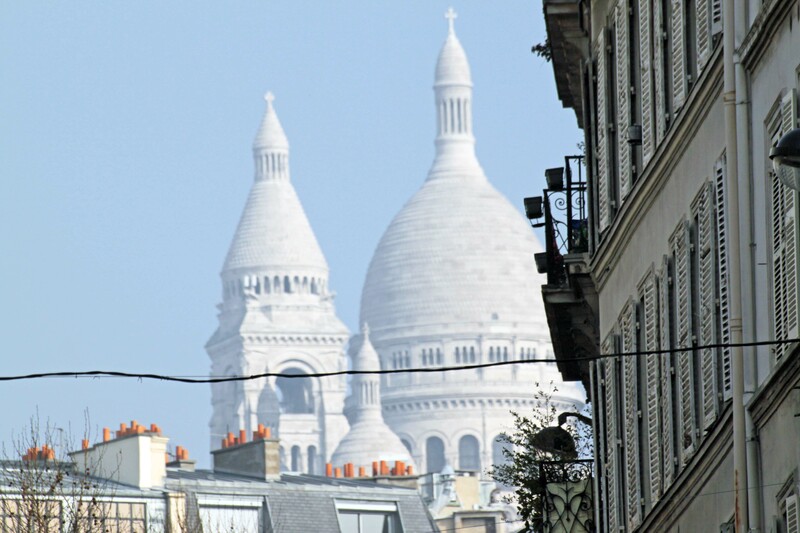 Adria J. Cimino has created a story that should be read and savored – much like the Montmartre life she depicts in Paris, Rue des Martyrs. And you remain pondering about the characters’ lives and choices long after the last page. Can you tell us about your background and how you landed in Paris? I started writing as a teenager in Sarasota, Florida… but I was shy about it and didn’t share it with anyone. By the time I was in college, even though I still was uncomfortable about sharing my writing, I knew that I wanted to be an author. I figured I would be OK with sharing my work once I was happy with it! I also knew I would need a day job! So I decided on journalism, since it involved writing. I started working on the school newspaper and enjoyed interviewing people and learning about their lives and activities. I also studied French from middle school through college and dreamed of visiting Paris… So like many other students right out of college, I went to Paris, and that’s where I met my French husband! We lived in the U.S. for a while and I worked as a journalist. And then at one point I decided to take control of my destiny. This was the moment to make that move to Paris! My husband was fine with it so off we went! The inspiration came from two completely different directions. It started with an article that my mom had read about Colombian emerald brokers. She shared it with me because she had found it so interesting… and I found it interesting too! The character of Rafael was immediately beginning to form in my mind. And I didn’t even have a full story for him at that point! But soon enough, the second source of inspiration appeared: City life. I would see the same strangers crossing paths each day, and I said to myself: What would happen if they met, if they made a difference in each other’s lives? Because your book has 4 different stories it’s 4 main characters, was it difficult to write? The challenge was making sure that I really felt as if I were in the shoes of Andre or Cecile or any of the other characters as I was writing their part of the story. After completing each chapter, before starting on the next (which would be the story of another character), I always would get up for a short time and do something else. That made it easier to slip into the next story when I returned to the computer. And, surprisingly, it wasn’t as difficult as it may seem because the characters are so different. Can you describe your writing process? Is there a specific ritual you follow? I generally think of a storyline/characters for months before sitting down and writing. I have them in my head and I think about the characters as I go about my daily routine – almost as if they are people I know! I start writing when I feel the characters have truly come to life for me and I have a basic idea of how the novel will begin and what direction it will take. In some instances, I know how it will end and in others, I figure that out as the story moves along. Before I start writing, I note ideas or a paragraph or two roughly summarizing the plot, but I never do outlines or detailed summaries, which for me, take the magic out of writing. What do you think your characters would say after reading your novel? I hope my characters would feel the same connection with me that I feel with them! And I hope they would say that the path I had given them was just and corresponded with their personalities and motivations as I created them. I know this is like asking a mother to pick her favorite child, but who was your favorite character to write? Was there one who was more difficult to let go after you finished writing the novel? When I started to write, I expected my favorite to be Rafael… because the whole idea really started with him. And in a way, Rafael was my favorite. He was very hard to let go. But I think I had the most fun with Andre. I felt as if there were a lot of aspects of his personality that his neighbors and acquaintances didn’t recognize and I enjoyed developing those. 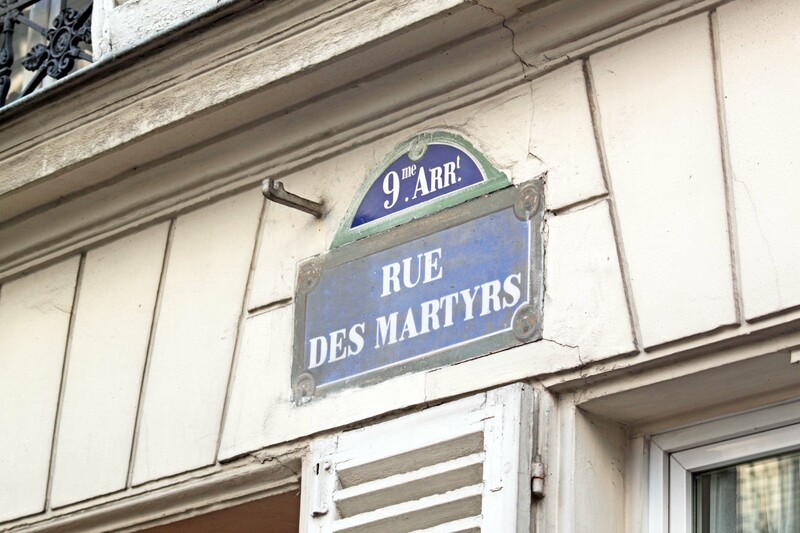 When writing this novel did you spend a lot of time on Rue des Martyrs? Yes! Just wondering about and daydreaming… imagining my characters right there in the neighborhood. I didn’t aim to recreate each café or apartment building on the street, but instead wanted to capture the spirit of the Rue des Martyrs. You still can find me strolling along the street or stopping at a café there. What advice would you have for someone coming to Paris for the first time? I would say have a look at the Eiffel Tower from afar, take a long walk along the Seine or a Seine River cruise to see the lay of the land, spend time at cafes, treat yourself to pastries from the lovely bakeries and people watch! 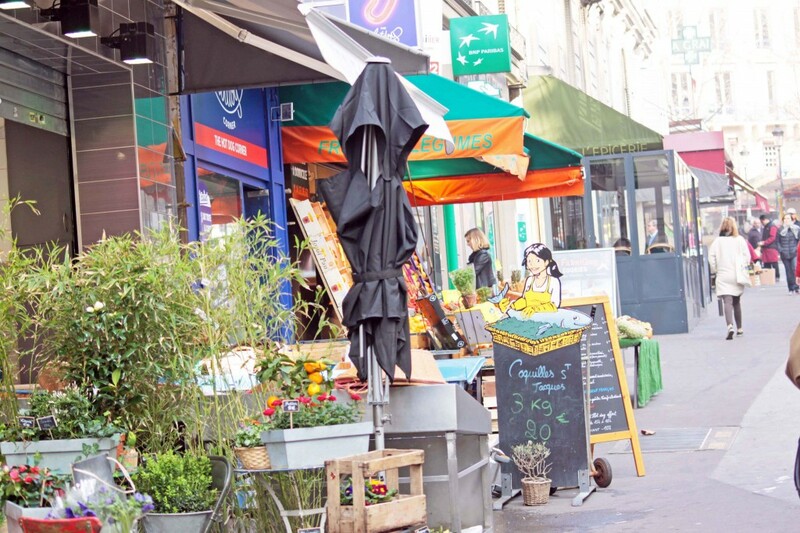 Can you share with us your favorite “off the tourist radar” spot in Paris? Talk a walk along part of the “Promenade Plantee” in the 12th arrondissement… A beautiful path of greenery that runs along a former train line. It starts around the Bastille area and continues to the bois de Vincennes. It’s a great mix of nature and Parisian architecture. You’ve lived in Paris for many years now. Do you still pinch yourself in disbelief? Yes, sometimes! But there are times when I lose myself in my routine, unfortunately. I’ll grumble about the subway or the weather… And then I’ll scold myself and say: What are you complaining about? You are in one of the most beautiful cities in the world! What’s your favorite Parisian “hidden gem” to shop for fashion? My hidden gem for fashion is “Carmen Ragosta.” She’s an Italian designer whose shop is in the 10th near the Canal Saint-Martin and I’ve been a customer for years! Will you write another novel set in Paris? Absolutely! But you will be exploring other places with me if you join me on the adventure of my second and third books. The second is called “Close to Destiny” and is set for publication in March. This story, which explores the role of destiny in life, takes place in London and New York. And the third is set in the South of France. After that, I just might be returning to Paris. Write what comes naturally rather than following trends. If your style is humor, for instance, than that’s what you should write. Get a good editor and trust him/her. And never give up. Writing is such an individual thing so I don’t think my favorite authors have influenced my style very much. As a writer, you’re almost forced to be yourself. But authors who have influenced my way of thinking or observing or even subjects that I’m interested in tackling include Ernest Hemingway, Amy Tan and John Dos Passos. Have you read anything you’ve loved lately? The last book I really enjoyed was “Call Me by Your Name” by Andre Aciman… I was impressed by his ability to create extremely powerful emotions. I have stories appearing in two multi-author anthologies to be published through my new indie publishing house, Velvet Morning Press. The anthology “That’s Paris” is set for release on Feb. 2, and “Legacy” will be available later this spring. I’m also in the process of editing my third novel. I’ve been writing for about 15 years so I have a lot of material waiting in the wings. Adria J. Cimino is the author of novels “Paris, Rue des Martyrs” and “Close to Destiny” (set for release March 2015) and is co-founder of indie publishing house Velvet Morning Press. 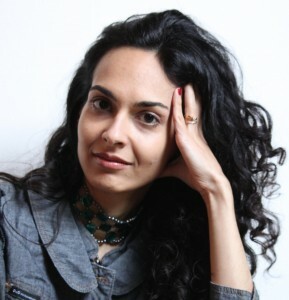 Prior to jumping into the publishing world full time, she spent more than a decade as a journalist at news organizations including The AP and Bloomberg News. 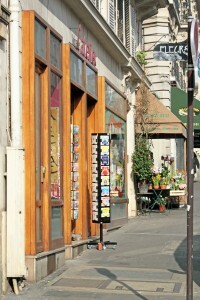 In addition to writing fiction and discovering new authors, Adria writes about her real-life adventures in her blog “Adria in Paris.” You also may learn more about Adria and her work by visiting her website at ajcimino.com or following her on Twitter at @Adria_in_Paris. To celebrate the re-release of this great book, Je Suis. 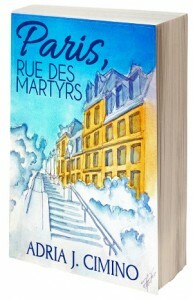 PARIS is giving away 5 copies of “Paris, Rue des Martyrs” by Adria J. Cimino in 2015. Enter now for a chance to win your copy. NOTE – Paris, Rue des Martyrs, originally released as an ebook in early 2014, is being re-released in print and ebook form on Jan. 5, 2015. The ebook version is currently available for preorder on Amazon. Written by Raquel Segura for the Je Suis. PARIS Blog. Looking for a Paris vacation that brings you up close and personal with la vie quotidienne de Paris? Check out one of our Esprit de Paris Tours. I love the photos! And great advice about writing what feels natural to you. For years I’d thought on and off about becoming a writer and I would start books that were so forced it was awkward. No wonder they never went anywhere! When I finally started writing what I liked, it came much more naturally and was way easier–and tons more fun! Vicki I’ve had the same idea I’ve been working around my head for years. Maybe it’s the time to start putting down on paper? It was my pleasure Adria. And yes I think I’m ready to carve out some time for writing. A la prochaine et bonne chance!